As conservative lawmakers across the country work to restrict abortion access with increasingly creative and devastating regulations, a national network of abortion rights advocates is fighting to radically expand the pool of available providers in the United States one lawsuit at a time. Activists are emboldened by the Supreme Court’s landmark 2016 decision, Whole Women’s Health v. Hellerstedt, which struck down parts of a Texas law that shuttered half of the providers in the state. The law required abortion providers to obtain admitting privileges at a nearby hospital and mandated abortion facilities to satisfy the standards of ambulatory surgical centers, neither of which had anything to do with the safety of the procedure itself. The Court struck down the requirements, saying that they placed an undue burden on a person’s ability to access an abortion. 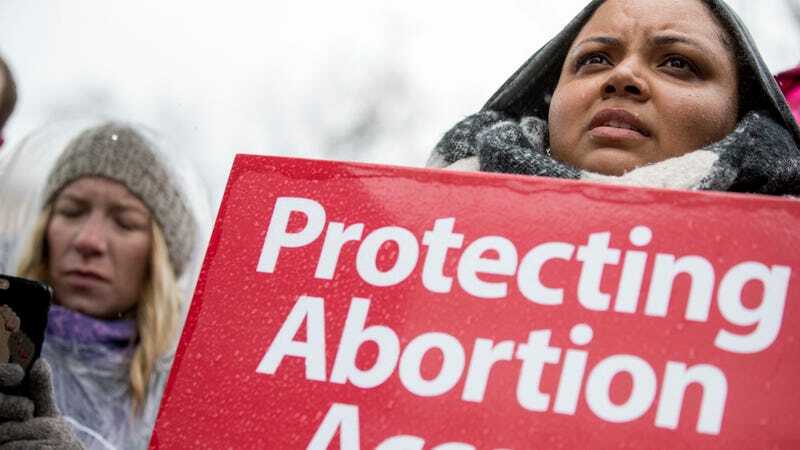 “It’s changed the way we were thinking about abortion law because you’ve given us the ability to look toward protecting access in a way that we haven’t been able to,” Elizabeth Nash, Senior State Issues Manager at the Guttmacher Institute, told Jezebel over the phone. She said that as a result of the ruling, abortion rights activists are pushing to decriminalize self-managed abortion, use telemedicine for abortion provisions, and allow advanced-practice clinicians (APCs) to perform abortions. Currently, 34 states allow only physicians to offer medication abortions. California, which lifted its physician-only ban in 2014, is one of the few states that allows APCs to administer both medication abortions and surgical abortions during the first-trimester. While an estimated one in four women will have an abortion in her life, 90 percent of U.S. counties do not have an abortion clinic, and most women who live in rural areas have to drive more than 50 miles for reproductive healthcare. According to the Guttmacher Institute, the number of clinics, hospitals, and physician offices that offered abortions dropped by around 60 percent between 1982 and 2014. Given the inaccessibility of abortion for so many, “Making sure that there’s an expanded pool of providers is very, very important,” she said. Research shows that APCs are trained—and just as competent—as physicians to perform early abortions, which represent the majority of abortions in the country. “There shouldn’t be a barrier in expanding the pool for providers,” Nash said. A complaint filed in Maine, for example, argues that the decline of clinics with licensed physicians is further impeding abortion access, especially in rural areas. The lawsuits allege that the travel time and cost of visiting clinics that may be, in some cases, more than 100 miles away, creates an undue burden on patients seeking abortions, and that allowing APCs to perform abortions would greatly expand access.